Milwaukee clinched the No. 1 seed last week, while No. 2 Toronto, No. 3 Philadelphia, No. 4 Boston and No. 5 Indiana are locked into their spots. Brooklyn and Orlando are in as well. 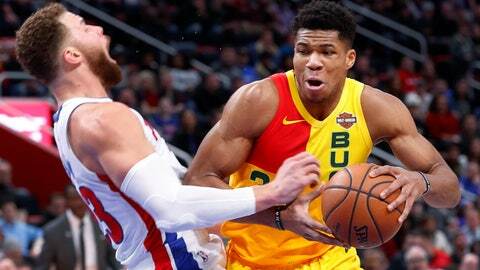 That leaves three teams to duke it out for that eighth seed: Detroit, Charlotte and Miami, and while the Pistons are the frontrunners, there's just enough runway left to keep things interesting. FiveThirtyEight gives the Pistons an 88% chance to grab the eighth seed, while the Hornets have a 12% chance and Miami is under 1%. Remaining games: Tuesday vs. Memphis, Wednesday at Knicks. Bucks matchup: Milwaukee won all four games, including two on the road. Skinny: The Pistons are in the driver's seat down the stretch, but they're by no means secure. If the Pistons win out, they're in. A single loss opens the door for the Hornets and Heat. Detroit has lost four straight, while Blake Griffin is ailing, but the Grizzlies and Knicks aren't exactly intimidating. Remaining games: Tuesday at Cleveland, Wednesday vs. Orlando. Bucks matchup: Milwaukee went 3-1, with the lone loss at Charlotte on Nov. 26. Skinny: Kemba Walker and Frank Kaminsky powered the Hornets to a season-saving win over the Pistons on Sunday, but they've still got work to do after winning three straight. Charlotte staved off elimination, but doesn't quite control its own destiny. They need to win out, and need either the Grizzlies or Knicks to knock off the Pistons. Remaining games: Tuesday vs. Philadelphia, Wednesday at Brooklyn. 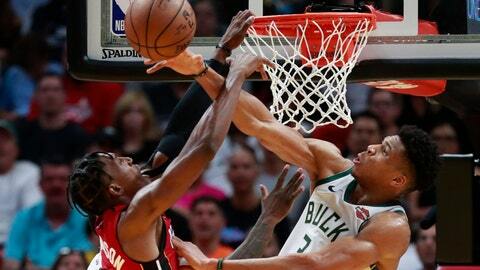 Bucks matchup: Milwaukee is 3-1, with the lone loss coming at Miami back on Dec. 22. The three wins were all by 15 or more points. Skinny: Miami is also banking on a Pistons (and Hornets) collapse, but neither tiebreaker is favorable for the Heat. They've now lost four straight, including a devastating overtime loss to Toronto on Sunday. The Hornets' win over the Pistons pushed Miami to the brink. The Heat now need the Pistons to lose two and Charlotte to lose one. Maybe the prospect of Dwyane Wade's final home game is enough to push the Heat past the 76ers on Tuesday, and perhaps the same is true at Brooklyn on Wednesday, but it's a pretty tall order.